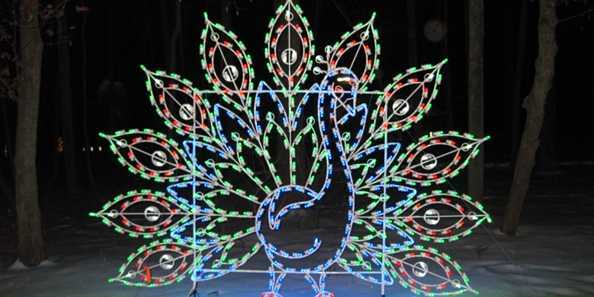 Holiday Lights Wisconsin – Check Out Our Picks! Hop the Jingle Bus in downtown Milwaukee, or walk around this rapidly redeveloping district, and check out beautiful, colorful holiday light and animated displays in Cathedral Square Park, Pere Marquette Park and Zeidler Union Square. Streetscapes are transformed by sparkling rooflines, special lighting and suspended décor above downtown intersections. $2 Jingle Bus rides operate Thursday through Sunday evenings connecting visitors to all the sights now through December 31. Best place to get tickets? The Shops of Grand Avenue on Wisconsin Avenue, with easy access via I-794, 43.94, U.S. 18, and Highways 32 and 145. 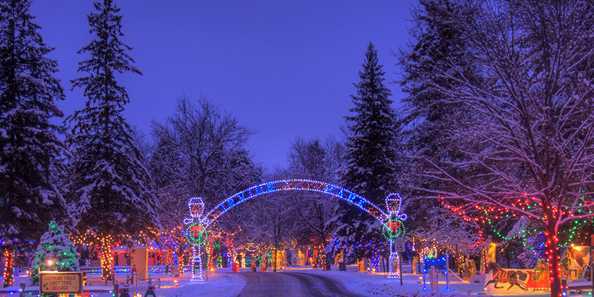 Head to northern Racine County for a ride through Yogi Bear’s Jellystone Park campground along Highway 38 in Caledonia and enjoy over 1.5 million lights, with displays and exhibits to dazzle! Check out one-of-a-kind hand-crafted displays featuring elves, reindeer, forest friends, beloved children’s characters, and more – it’s like stepping into one of your favorite Christmas movies. Explore Santa’s workshop, ride their big sleigh – with a capacity of 43 – and even meet “Evy the Evergreen,” a new 7-foot tall, magical Christmas tree. He talks, leads friends in Christmas Carols and tells stories. It’s a two-fer in beautiful Chippewa Falls. The historic Cook-Rutledge Mansion is decked for the holidays and offering special tours. Meanwhile, Irvine Park – already awesome for its zoo, Wobbly Bridge and more – offers its Christmas Village with more than 100,000 Christmas lights and life-size scenes replicating the Victorian era as well as Chippewa Falls’ early history. U.S. 53 and Highways 29 and 124 bring you there! 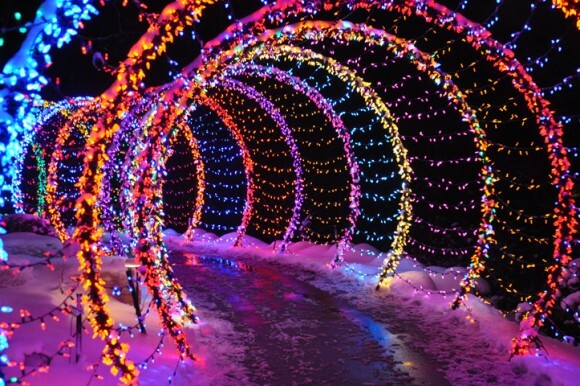 The already-beautiful Wildwood Park & Zoo in Wisconsin’s “Hub City” of Marshfield gets even more dazzling this holiday season with Rotary Winter Wonderland, with over ONE MILLION twinkling LED lights and animated displays you can walk or drive through. There’s Santa’s Village, Nativity scenes, holiday music and so much more. It all takes place just off Central Avenue (historic Highway 13), near U.S. 10, today’s Highway 13 (the “through-pass”) and Highways 80 & 97. Check out the Blue Heron Brewpub, the city’s vibrant downtown, and more when you go! 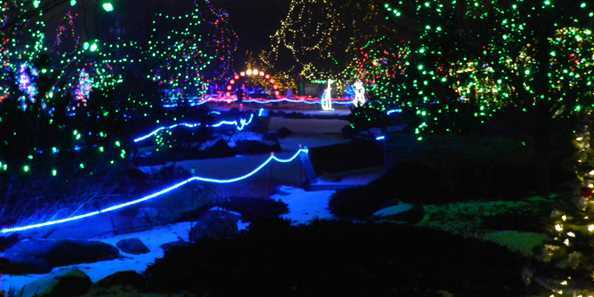 The WPS Garden of Lights brings the magic to the Green Bay Botanical Garden for the 21st year on weekends through Christmas Day and daily from there through December 30th. 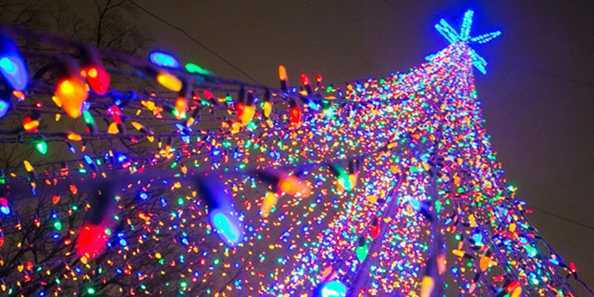 Check out more than 250,000 twinkling lights. Discover a spectacular array of botanical-themed light displays featuring an enchanted icicle forest, glistening flowers, a dazzling 60-foot walk-through caterpillar, and much more. The show is topped off with northeastern Wisconsin’s tallest and brightest shining tree. Enjoy this stunning winter landscape by foot or take a horse-drawn wagon ride. Janesville, the “City of Parks,” offers the beautiful Rotary Botanical Gardens all year long, but during December illuminated garden pathways greet you for an evening stroll through wintry garden paths brought to life with 425,000 twinkling lights, 100 beautifully decorated trees, over 2,500 luminaries, 500 dangling icicle lights hung from the tallest trees in the Garden and more. Back by popular demand are the Selfie Stops & Photo Opps, with fun props and amazing backdrops that offer holiday photo opportunities both indoor and out. Step inside to enjoy a warm beverage as you watch the 200′ electric model train display, hand-sewn quilts, festive local musicians and holiday shopping. One of our favorite free zoos is Lincoln Park Zoo in Manitowoc. Now, there’s a small charge for Lights in Lincoln Park, but it’s totally worth it! 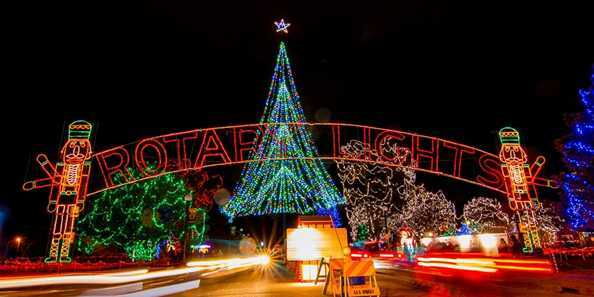 This consists of a fantastic drive-thru light show with animated displays, thousands of lights and a 60-foot lit tunnel. Proceeds go to the Lincoln Park Zoo. On Friday nights, you can visit Santa, too! You’ll find Lincoln Park on 8th Street just off U.S. 10/Highway 42 (Waldo Boulevard) on the north side of Manitowoc, about 4 miles east of I-43. U.S. 151 approaches from the south, too. Check it out as part of your Holiday Lights Wisconsin tour, and see the Wisconsin Maritime Museum, Beerntsen’s Candies, and so many other fun sights in the city of shipbuilders! 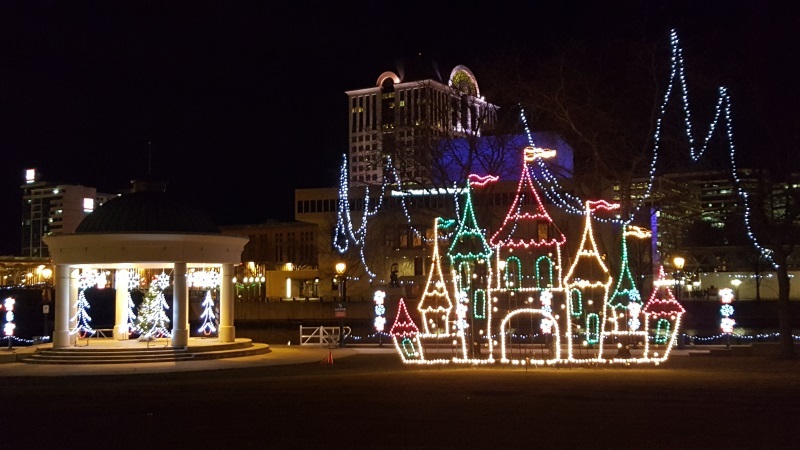 Menominee Park along Lake Winnebago brilliantly lights up the city with a 1.2-mile stretch of illuminated holiday wonder. A 100-foot tree, sculptured scenes, twinkling animated light displays and accompanying holiday music makes this part of Oshkosh magical during the holidays. Homemade holiday gifts will be available for sale for family and friends, carriage rides (December 17 & 20) and hay rides (December 14 & 21) will be available – advanced reservations required at 920-303-9200 – and Santa is around every night! 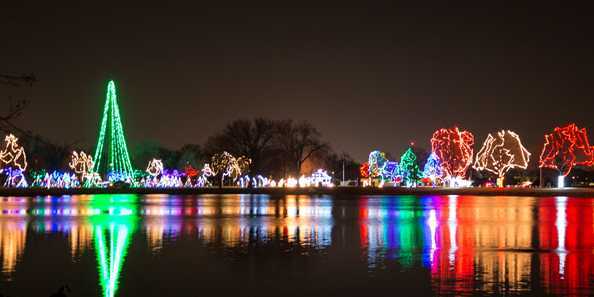 Oshkosh Celebration of Lights is open every day, 5-9pm. I-41, U.S. 45, and Highways 21, 26, 44, 76, and 91 all bring you to Oshkosh! Talk about a gorgeous drive… the Sheboygan County Rotary Club creates this amazing light show that can drive through to music! 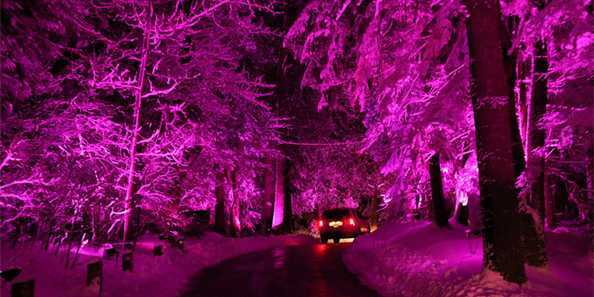 Just tune your FM radio to their signal and enjoy the sync-up with over 325,000 holiday lights on this 1.1-mile forested route. For your Holiday Lights Wisconsin Tour, I-43 and Highways 23, 28, and 42 all bring you there. FOUR MILLION LIGHTS?? Yup! 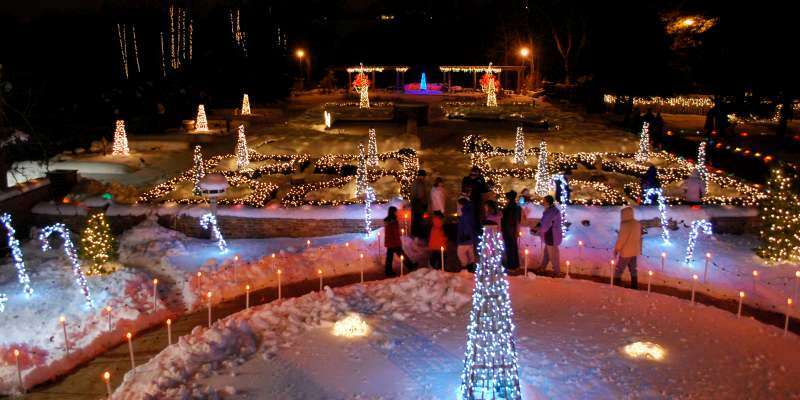 Riverside Park in La Crosse becomes an amazing splendorous wonderland featuring a 140-foot Christmas tree, live nativity presentations, and animated light displays with over 2,000,000 lights total. You have to see it to believe it on your Holiday Lights Wisconsin Tour, and I-90, U.S. 14/61, U.S. 53, and Highways 16, 33, and 35 all bring you to La Crosse so you can see it!